Earlier this year, you may have been among the few hundred (OK, maybe thousand) people I bombarded with emails, posts and pleas to vote for my humble short story “The Duck” in Bartleby Snopes’ monthly fiction contest. The winner of each month’s contest is automatically included in Bartleby Snope’s semiannual print journal. Alas, despite all my outreach and your kind votes, my simple story of young love (or is it lust?) was not victorious that month, coming in second place; however, many of you did send me kind words of delight and enjoyment at my story. You, dear readers, were not alone. The good editors over at Bartleby Snopes, led by the indomitable Nathaniel Tower, have seen fit to include “The Duck” in the semiannual print journal, despite its lowly second-place finish. You can buy the book on Lulu and get a print copy. You can download a PDF version of it right here for the low, low cost of free. Or you can get a Kindle copy sometime soon, just check this site to see if it is available. So thank you Bartleby Snopes, and thank you dear readers. 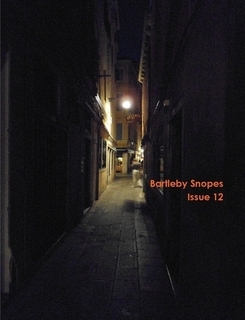 I hope you enjoy the fine collection of fiction in Bartleby Snopes 12, which includes work by Damon Barta, Andrew Bockhold, Jackson Burgess, Christopher Cassavella, Heather Clitheroe, Dusty Cooper, Rob Essley, Chris Fradkin, Jon Fried, Jill Gewirtz, J.D. Hager, Laurie Jacobs, Michael Janairo, Anna Lea Jancewicz, Mark Jaskowski, Danielle Kessinger, Edward Lando, Greg Letellier, Amanda Hart Miller, Michael Morshed, Justin Nguyen, Hun Ohm, Ryan J Ouimet, June Sylvester Saraceno, John Timm, Ian Woollen, and Leslee Renee Wright.